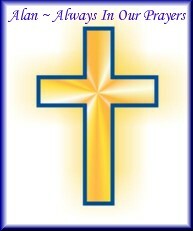 ALWAYS, YOU ARE IN MY THOUGHTS AND PRAYERS. 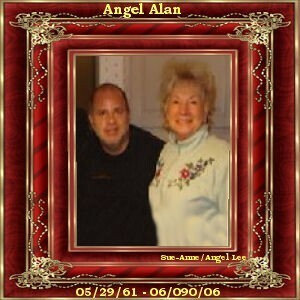 Sadly, both of Alan's parents, Sonny and Josie, have since joined him in Heaven. Alan hanging out in the kitchen with mom Josie, niece Adell, and cousin Christina. to go on and on and never know WHY. if I really knew why you had to leave you still wouldn't be here, I'd still be bereaved. YOU WILL NEVER BE FORGOTTEN, I LOVE YOU FOREVER AND EVER. than words can say. 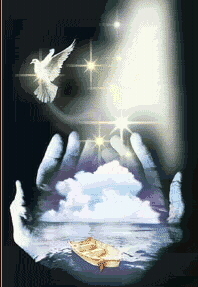 You are in my heart forever and ever, and some day we will be reunited. That will be a happy, blessed day. 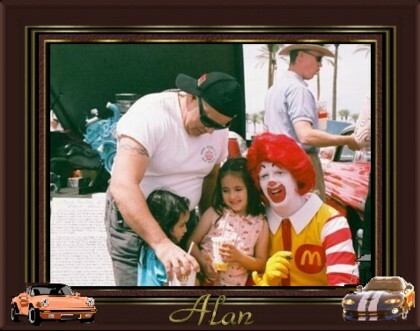 Alan at the classic car show on April 9, 2006, in Scottsdale, Arizona. 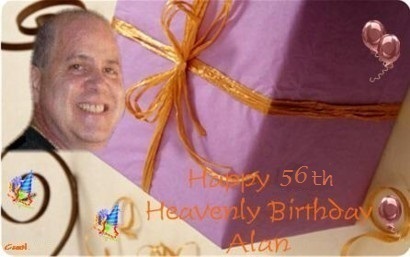 These two special gifts for Angel Alan are from my friend Marie. 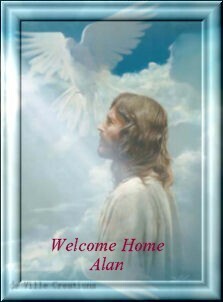 These are two beautiful and loving gifts to Angel Alan from my dear friend, Carol, mom to Angel Michael. 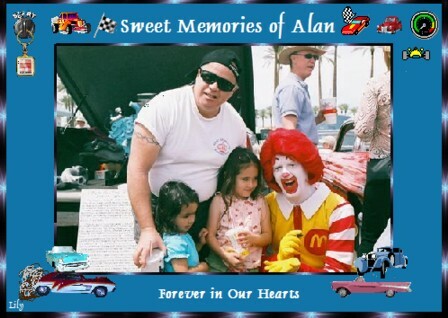 Alan clowning around with Ronald McDonald at the car show! SO MUCH WE WANTED TO SAY TO YOU, NEVER THINKING ONE DAY YOU'D BE GONE. 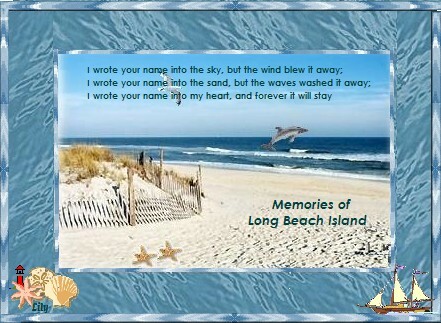 DEAREST CHILD, I FEEL SO LOST, WE HAVE THE MEMORIES WE SHARED TOGETHER, BUT IT ISN'T THE SAME. SO MUCH WE FOREVER WISH, DEAREST CHILD, YOU HAD NEVER DIED. ADELL, AUSTIN, ANDRIA AND JOEY MISS YOU TERRIBLY. SO MUCH YOU WILL NEVER KNOW. "HE ONLY TOOK MY HAND"
MY SON'S VOICE, I DID HEAR. 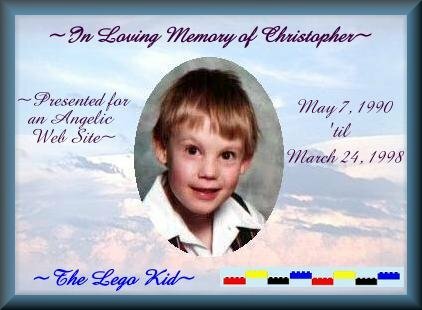 you became our number two son and now you would be a baby brother to your brother David. How wonderful to see your shiny bright eyes and the beautiful smile on your little face. It was such a joy to have you. You were a great little baby boy. Easy to take care of. You had a pleasing personality and you were a wonderful baby. and I always bought you models to make and keep in your room. went ice skating in the winter months. It still comes to my mind and it will never leave my mind. We miss you soooooooo much. You can not imagine. 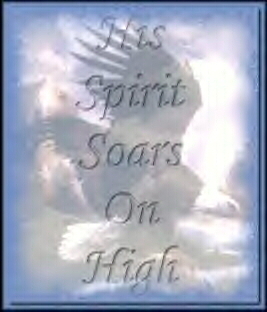 My love for you grows stronger every day - You are in my heart and my mind every minute of the day. My son, I will love you forever and ever. Until I am reunited with you, I am in a lost world without you. 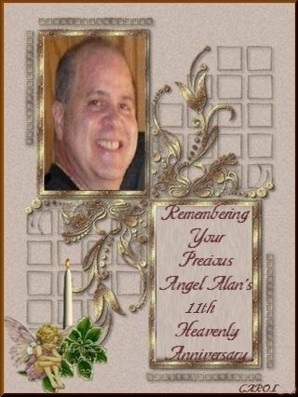 I miss my brother and think of him daily, I had so may many more questions and more projects to do with him. I will always miss him. and more like an adventure. 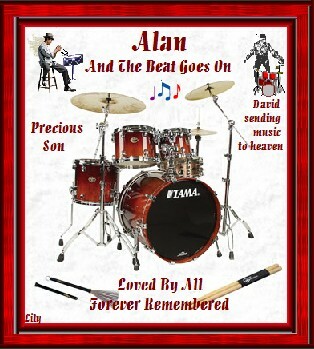 Alan loved playing the drums and was an excellent rock drummer. For years during our teens we played in bands together, Alan on drums, me on the bass. 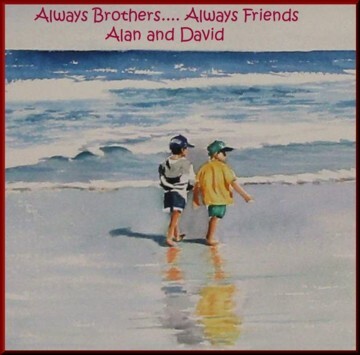 We were the rhythm section, my brother and I.
Click the link below to see a video of what 'was' Alan's band that he played in with his brother Dave. and that made us brothers twice over. he taught me I was able to build a car over the last three years, but not without much help and advice from Alan. I could say so much more about my brother, our times, our relationship, and what kind of man he was, but if you knew him, you already know. My main point in my short tribute is this. 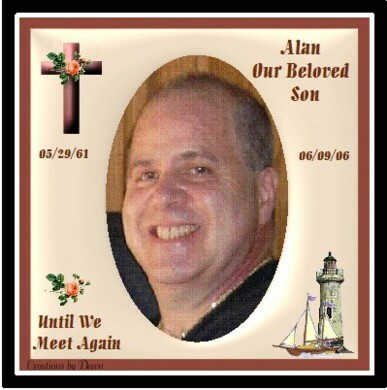 My brother Alan was a good, kind fun loving guy who always to tried help everyone in his life and asked almost nothing in return. I will miss my brother more than I could ever say in words; however, I am a better man for having had the privilege of being his brother. 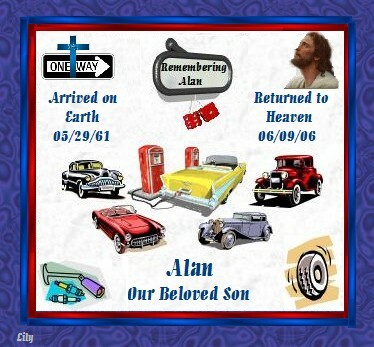 Alan’s legacy to me will be that I will be a better man every day, and I will do things right. 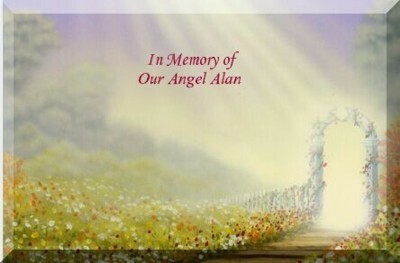 I will be kinder, I will be more tolerant, I will have the patience with others that Alan had for me. 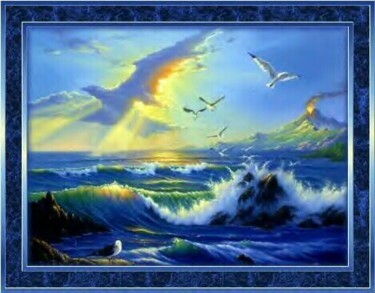 I will live everyday to its fullest and I will enjoy the beauty in this life and through it all I will always remember our good times together and smile when I think of him. Alan looks gorgeous in Christina's Easter bonnet. 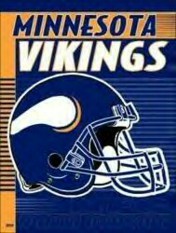 in our hearts and in our mind! to have taken you from us so soon. 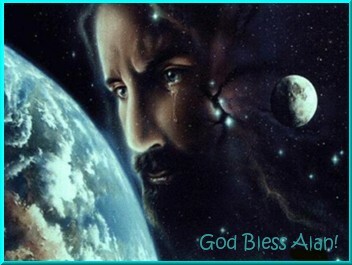 But please also watch over all of us, and be with us when you can. 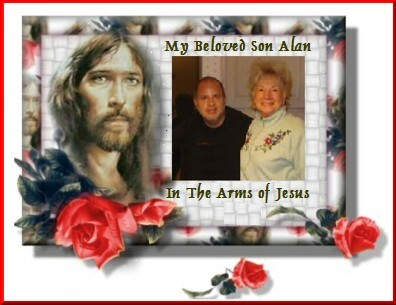 for Mom & Dad, and ALL of us who know and love Alan, we have confirmation that he is with us and will help comfort us. who comes to me in dreams at night. I close my eyes and you appear. Waiting for Easter dinner at Hotel Vitagliano (2005). 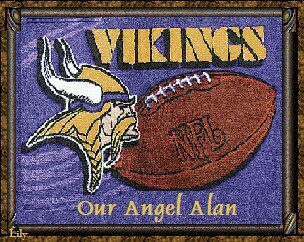 The news of Al's passing shocked and saddened me. 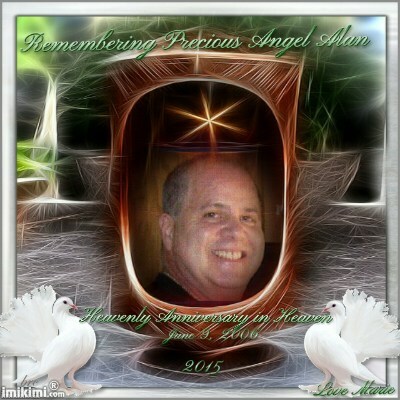 Al had a wonderful soul and light which was taken from us who knew him far too soon. 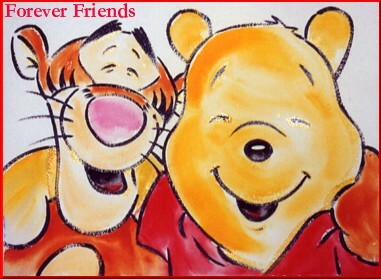 Al and Lora are great people who always helped people.I am happy to have considered them our friends. 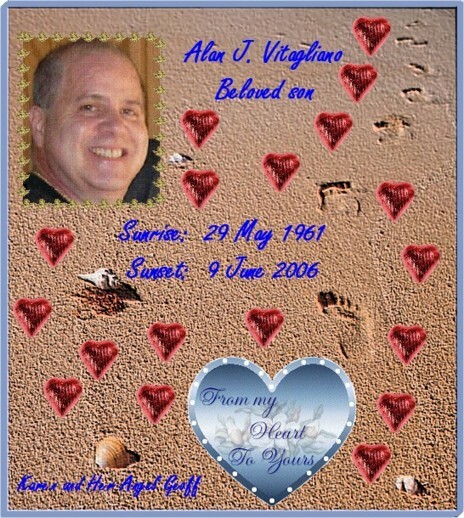 The memories I have of Al will help my husband and I through our grief. Sharing them with Lora has helped too. 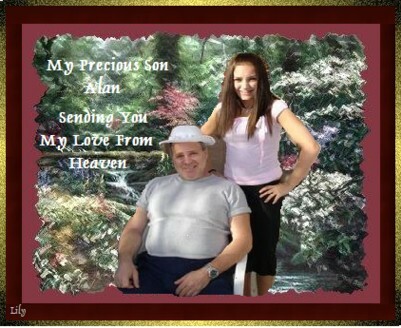 Al was a wonderfully special beautiful human being. I thank his parents and his family for bringing such a beautiful person up in this world that we have had the pleasure of sharing in his life and sadly death. I loved Al. He was like a teddy bear you just wanted to hug on. I will always think of him with a smile on my face, because whenever I saw him he put a smile on my face.I will remember that unique humor of his and his quick wit. That was my favorite quality in Al, was his ability to make me laugh. Telling a story or making an observation. Even when he wasn't trying to be funny he was making us laugh. 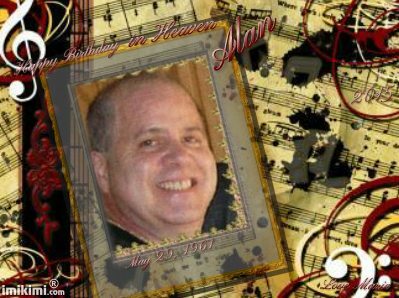 He was a good friend to my husband and I. Our cats liked Al too, they always got good pets from him. I miss him so much. Losing such a special person makes you sit up and take notice. We do not know how much time we have left on this journey called life. It can all be taken away from us far too soon. Hold your friends and family close. Tell them you love them at every opportunity. And most of all do what makes you happy. 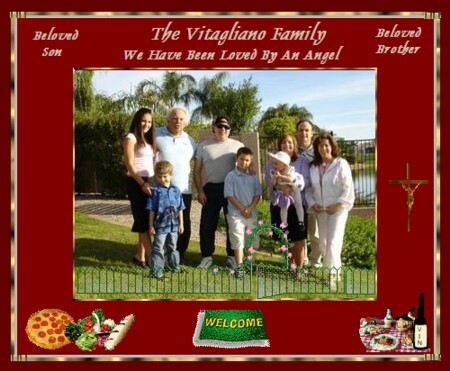 May God Bless the family of Al Vitagliano. My heart breaks for you losing your son, your brother, your nephew, your uncle, your cousin and your brother-in-law. 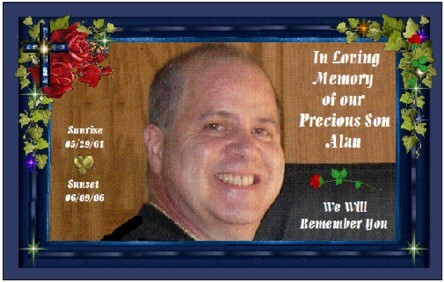 My heart breaks for me that I have lost my friend Al. I will always remember you. 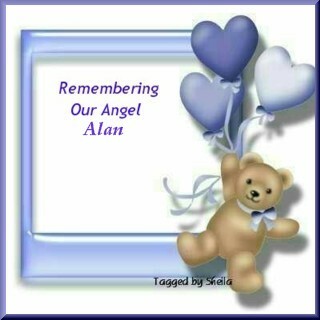 Alan, you were my cousin, my friend, my partner, words cannot explain what you meant to me. 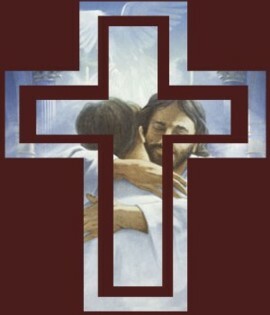 you took care of everyone when you where here, and now the lord needs you to take care of people up in heaven. I will always miss and LOVE you. 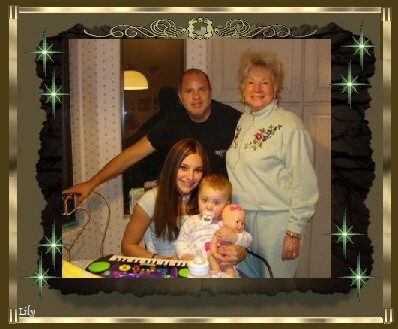 tell grandma and grandpa and uncle mario i LOVE and miss them also. 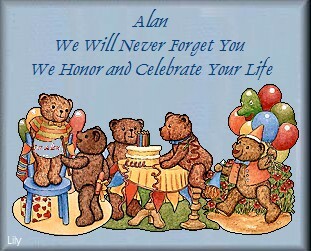 I find myself with so many memories of you, Alan, many have been buried for years. I spent so much time with you growing up I do not think I really ever realized the impact you made on my life. 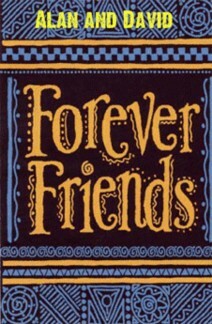 You were always there always a friend to me. You help to guide me through those difficult younger years and I was so blessed you were there with me to pick me up when I fell. I want you to know that I love you dearly and I am missing you. 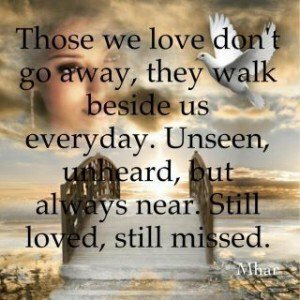 I find myself saying "why did I not call you, why did I not try to stay closer" I will never know the answer but I do know that in your passing you have taught me yet another lesson and that is to not put off until tomorrow what is in your heart today. Relationships/people are important and we all need to stay close. I will miss you until I see you at heavens gates. and so my love and thoughts are with them. where there is no sadness or pain. Alan and friends at a Packers fan's house enjoying the Vikings/Packers game. 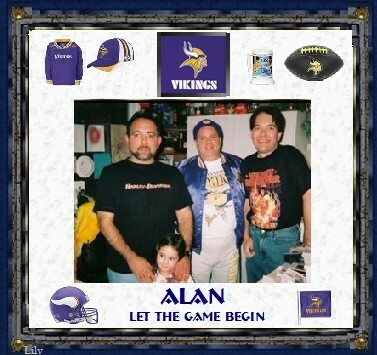 Packers won, but Alan always favored the Vikings. 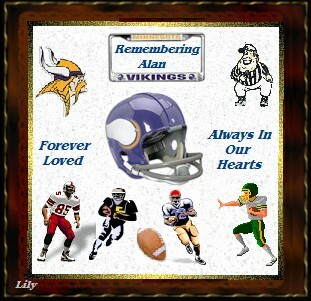 He loved the Vikings since he was a teenager and even had a little helmet that his uncle bought him when he was little. "I REALLY LOVED YOUR BROTHER ALAN, HE WAS MY BEST FRIEND, HE REPAIRED MY FRONT DOOR WHEN THE PARAMEDICS AND POLICE KICKED IT IN WHEN I HAD A SEIZURE ON THE TELEPHONE, AND HE REPLACED MY WATER HEATER WHEN IT WENT OUT. HIS DEATH WAS A SHOCK TO BOTH MY WIFE AND I, SHE IS SO GLAD SHE GAVE HIM A BIG HUG WHEN HE LEFT LAST TIME HE CAME OVER. I WILL MISS HIM AND THINK ABOUT HIM FOR THE REST OF MY LIFE. 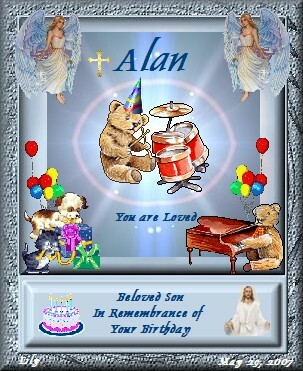 MY BROTHER-IN-LAW TRACY HAD PLANS FOR ALAN TO PLAY THE DRUMS FOR HIS BAND. I AM GLAD WE GOT TOGETHER AT LEAST ONCE AND JAMMED DOWN IN THE BASEMENT OVER AT LORA'S! TRACY THOUGHT HE WAS QUITE THE DRUMMER AND A VERY FINE HUMAN BEING. HE TOLD ME HE CRIED WHEN HE HEARD THE NEWS, SUCH A FINE YOUNG MAN WHO WAS TRACY'S AGE TAKEN FROM US ALL TO SOON,MY WIFE AGREES ALAN WILL HAVE THOSE GATES POLISHED AND PERFECT WHEN WE ALL ARRIVE. HE WAS A VERY SPECIAL MAN." GOODBYE MY FRIEND! DAVID G. MUNN. I often think about all the good times when we all lived in the same neighborhood and were raising our families. 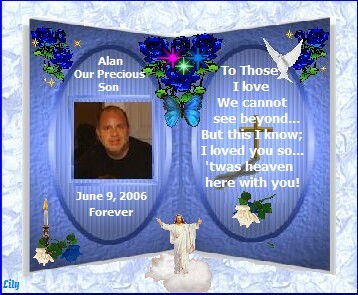 I have such fond memories of Alan and so do my sons, Tommy and Chris. They often mention him and remember the loving and caring person he was, and we're all sorry that he had to leave us so soon. 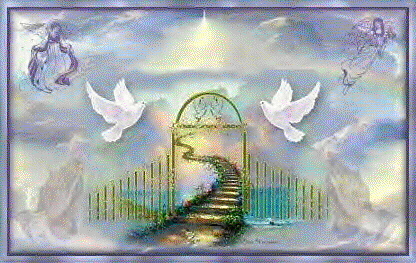 We look forward to seeing you and Joe When we come to visit Chris. 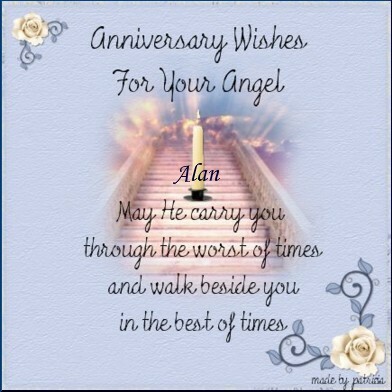 I just want you to know that I'll be here for you always, whenever you have the need to talk and to share memories of Alan. 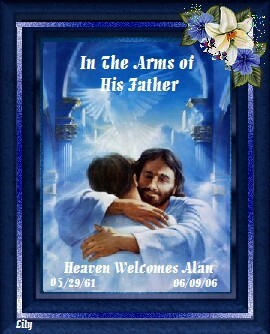 I truly believe in my heart that Alan is with the good Lord and he has found peace and comfort in the arms of the Lord. 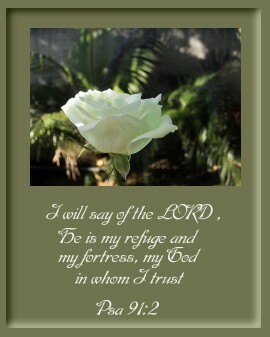 God bless you and comfort all of you. I love you very much and you will always be one of my dearest friends. and for framing Alan's photos. 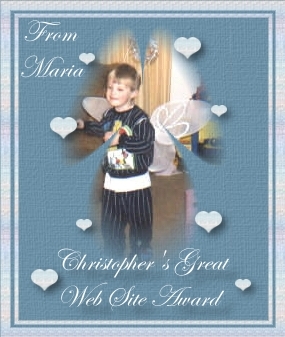 This page couldn't have been done without you! 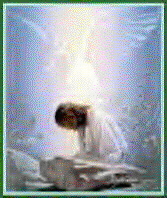 Who keep long vigil by the silent dust and weep. 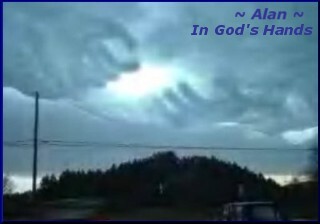 Nerving thy heart and trembling hand to comfort weaker souls than thee. from wrestling with demons and doubts and unanswerable prayers. 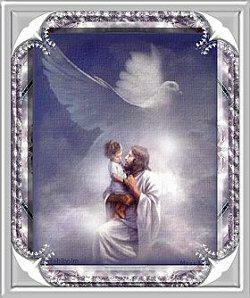 "GIVE ME BACK MY CHILD"
for it carries us farther and farther from our lost child. We're alike you and I.
but stronger for our sorrows are shared. "WE NEED NOT WALK ALONE." 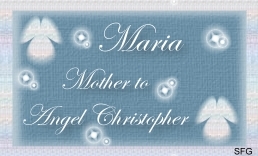 A small gift from one grieving mother to another. 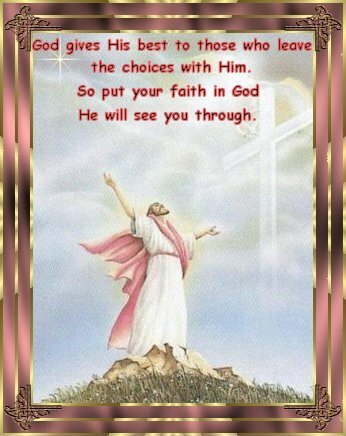 May God bless and comfort you.